Welcome to a new weekly feature on La Fashion Folie blogspot, where each week I will show you how to inject some catwalk style into your wardrobe with look-alike pieces from the high street. 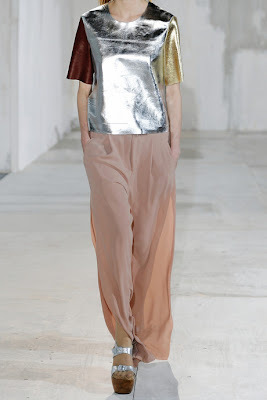 This week I'm featuring Acne's uber-trendy 'Moma' futuristic metallic finish leather top, that wowed the fashion pack at London Fashion Week back in February. However, at a cool £770, its safe to say Acne's Moma is out of most of our budgets. 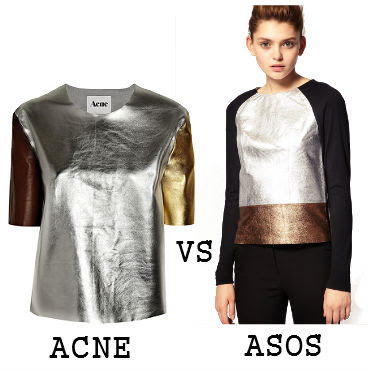 But never fear, e-commerce giant ASOS have created their own metallic finish leather top that has more than just a hint of the ACNE look about it, all for a more purse friendly £70. Yeah I would definitely spend 70 vs 770, it still looks just as good. I agree, the ASOS top is much more wearable!